This is an article that I submitted to Grass Roots magazine a few years ago. With my recent post on Instagram/Facebook showing Molly with her calf, and my tale of finding her with the calf and going to get Pete and both of us coming back, but Molly had already hid the calve and we did not see it again for two days.... I few people have asked about cows hiding their calves and this article covers that and other weird things that cows and calves do! Also we haven't milked yet - trying something new to see if we can get away with not milking all the time, which has been successful so far, will write more when we have fully tested this method. 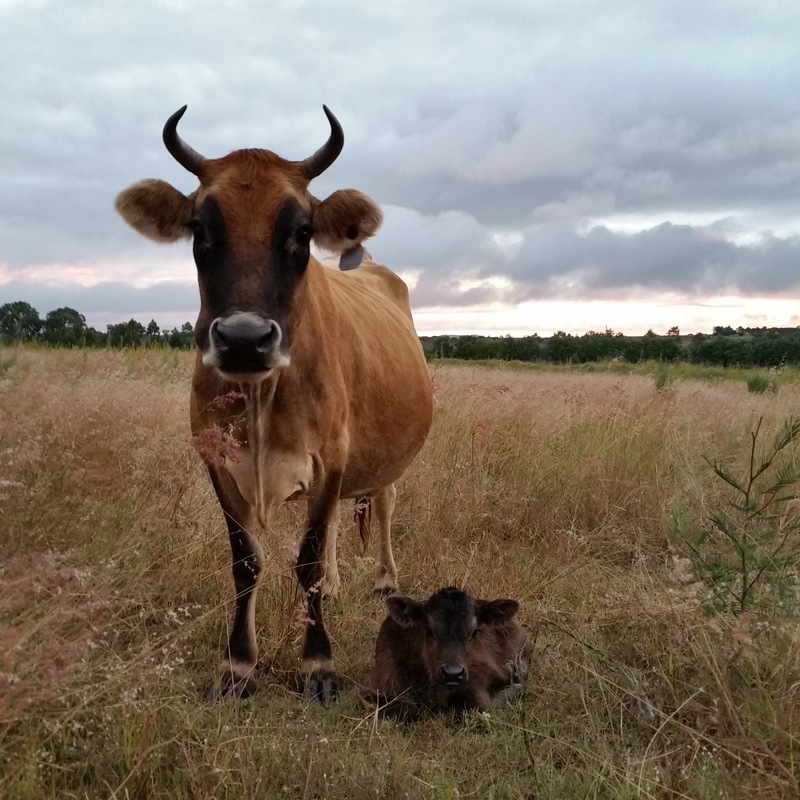 If you haven’t spent time observing a cow with a new calf, you might be surprised to learn how cows go about their mothering. I have heard of people who are used to sheep who get quite a shock with the apparently blasé attitude of a new mother cow. Unlike ewes, who keep their newborn lambs with them at all times, cows tend to hide their calves away to sleep in the grass while they wonder off to graze nearby. The cow usually doesn’t become concerned about being separated, but she will be keeping an eye on the calf, and if you get too close, she will come and let you know. Don’t worry if you can’t find the calf for a few days, it may just be very well hidden. Calves are generally pretty quiet at first, but they learn to call out if they are hungry or in danger and then mama cow will come running. If the cow realises that she can’t get to her calf or can’t find her calf, then they will both start bellowing (this is the noise all night at our place when we separate cow from calf for milking). Molly does occasionally lose her calf and bellow accusingly at us, she is very grateful when I help her to find her calf again. At first the calf will spend most of its time resting, with brief bursts of energy, which we call “mad calf laps” because they seem to just run laps of the paddock as if they are training for a race. The poor cow has no control over her calf, and will jog after it, mooing gently, to which the calf usually pays little attention. Gradually the calf becomes more settled, it will stop the mad running around and spend more time standing up and grazing with its mother. Eventually, after several weeks, the calf will reach a stage where it will follow its mother, and then the easiest way to separate the calf for milking is to lead them both into a pen, and then lead the cow back out while blocking the calf. In a herd of cows, the older calves tend to hang out together, separate from the rest of the herd, with one or two cows to look after them, we call this the “nursery”. If your cow is tame you can carefully approach the new calf, but do be wary as she may not appreciate your attention, and could attack you. The newborn calf is quite easy to handle, and smaller calves can be carried or led on a halter. This can be useful at first if you need to get the cow to come to the milking bales, as she will usually follow her calf. Do not be deceived, as soon as that calf is stronger, you will not be able to catch it again! It is best to do any cattle management activities, such as castration or ear tagging, while you can still catch the calf, because when it gets bigger and faster, you will have to be good at crash tackles if you want to get near it. The calf will get tame again after a few months, if you regularly feed grain or hay, so that will be your next opportunity to catch it, but by then it may be too big to tackle. I also made the mistake of putting an old dog collar on a calf while it was small, with the intention of halter training, but the calf became too wild as she grew bigger, and it then became necessary that we catch the calf and remove the collar before she grew too big for it! One last thing that may surprise you, for the first few days, before the calf starts eating grass, its poo will be bright yellow and smell like cheese! Do not be alarmed, the calf’s poo will gradually turn brown as it eats more grass over the first few days of its life. We have had three calves born on our property to our two Jersey house cows, and many more to our beef cattle, and watching the cows and calves as they grow has been fascinating. I hope these tips will help those who are new to cows and calves. And now we have even more calves to amuse us! Have you experienced cows hiding their calves? Any other funny behaviour?